I picked up this mini bar at a Teuscher chocolate shop during a wiz around chocolate shops. I had it recommended to me as a quality Swiss chocolate. It was certainly interesting and I’m always up for a good chocolate – especially a good coffee chocolate. When you open the wrapper on this bar you are absolutely sure this is a coffee chocolate bar. The heady scent of coffee comes through and greets your nose. The mini chocolate bar was not inexpensive so I expected something really nice. The chocolate itself was dark and sweet which was almost the perfect balance. I might have reduced the sugar quantity slightly and maybe pulled the beans out slightly sooner as they taste over roasted but all around an unchallenging bar that is going to be perfect for anyone. This is not a high quality chocolate and the flavout oft the chocolate itself is muted, especially with the sugar and chocolate. As a novelty this is fun but I have to say that I’d probably choose a different coffee chocolate like Green & Blacks Espresso or Thorntons Coffee bar. 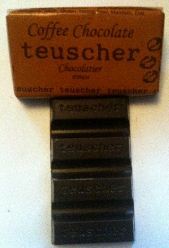 I have found that Teuscher over-flavors some of their bars – their lemon and mint bars in particular make it impossible to actually taste the chocolate. I am most impressed with the texture of their chocolates, especially their darks, and enjoy their plain bars (as well as their truffles).